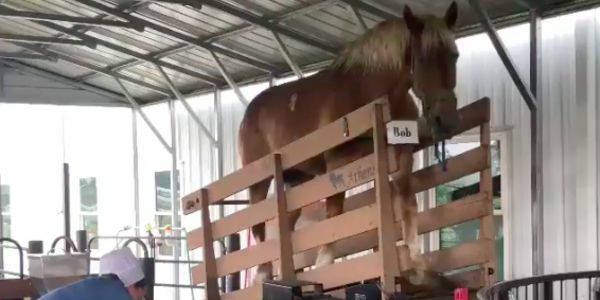 petition: They're Exploiting Bob the Horse for Ice Cream! They're Exploiting Bob the Horse for Ice Cream! Bob is a 2,000 lb Belgian draft horse who is forced to walk the same treadmill day in and day out at a petting zoo in Northern Indiana. His treadmill powers an ice cream maker and a merry-go-round. Sign the petition if you want Bob to live a life free of tedious and exploitative work! Horses are smart creatures, and walking on an incline all day everyday must be extremely boring. But it's also strenuous. He is probably getting repetative motion injuries because no horse in the wild would move like this all the time. Bob was purchased from the Amish community, who actually use horses in a more ethical way to help them in farming. But Bob is being used purely to attract customers and make more money for a furniture outlet store and that's just wrong. Please sign my petition to ask the owner of the store to free Bob and let him live out his life in a safe and comfortable place.